of the Best American Society. By Richard A. Wells, A.M.
Springfield, Mass. ; Cincinnati; Sacramento; Dallas, Texas. A lady or gentleman should finish their toilet before entering the room for dancing, as it is indecorous in either to be drawing on their gloves, or brushing their hair. Finish your toilet in the dressing rooms. Always recognize the lady or gentleman, or the director of ceremonies with becoming politeness: a salute or bow is sufficient. A lady should always have an easy, becoming and graceful movement while engaged in a quadrille or promenade. It is more pleasing to the gentleman. A lady should never engage herself for more than the following set, unless by the consent of the gentleman who accompanies her. It is very impolite and insulting in either lady or gentleman while dancing in quadrille, to mar the pleasure of others by galloping around or inside the next set. If a gentleman, without proper introduction, should ask a lady with whom he is not acquainted to dance or promenade, the lady should positively refuse. Recollect, the desire of imparting pleasure, especially to the ladies, is one of the essential qualifications of a gentleman. 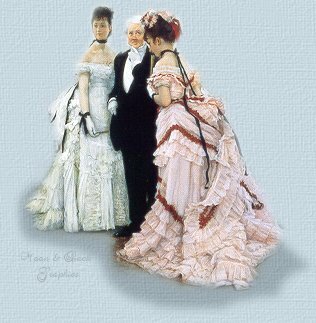 Ladies should not be too hasty in filling their program on their entrance to the ball room, as they may have cause for regret should a friend happen to enter. An introduction in a public ball room must be understood by the gentleman to be for that evening only, after which the acquaintanceship ceases, unless the lady chooses to recognize it at any further time or place.